Tamil star hero Ajith is currently busy shooting for his new film titled Viswasam. The movie is the fourth film in the combination of Ajith and director Shiva. The makers recently started shooting of the film in a specially erected Madhurai set in Ramoji film city. The makers are canning the song in the movie and it is heard that the song is coming out well. Nayantara is playing the leading lady in the film and the makers will be shooting some important sequences soon after the song. The schedule is going to happen for almost 1 month in Hyderabad and the music director Imaan has been to the film’s sets yesterday. 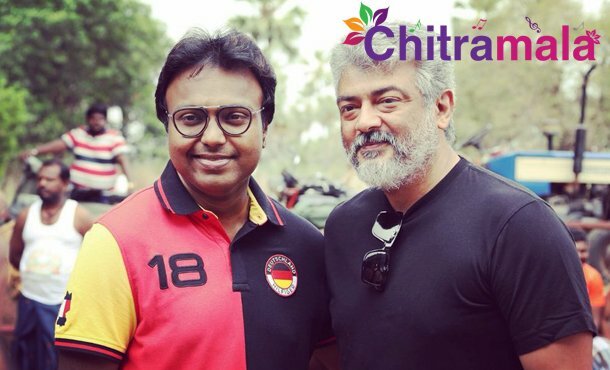 Imman has posted about his visit to the film sets and posted a picture with Ajith on Instagram. “Not so often I get the opportunity to view the visual making of my song. But today it was pure bliss to watch the man of simplicity to enjoy and dance to my tune in Viswasam. Thanks, Ajith sir for the invite. Thanks director Shiva sir and Satya Jyothi.” Wrote Imman on Twitter.